Paste has your back this season with eight fun gift ideas for book lovers. From literary t-shirts with eye-catching designs to a Harry Potter art book, these presents are perfect for the readers in your life. And for even more gift ideas, check out our gift guides with presents under $20 or Star Wars items. Bookworms can be die-hard fans when it comes to certain stories. 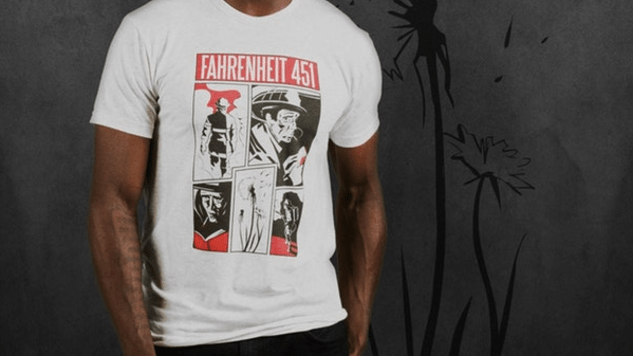 So instead of buying them yet another copy of 1984, purchase a shirt sporting the book cover instead. Available in men’s and women’s sizes, Out of Print tees feature dozens of titles, from classics to children’s picture books. What’s awesome about Book of the Month is that it allows you to give your loved one books, but they get to choose which ones! At the beginning of each month, they’ll have their pick of five new, curated titles. They’ll make their selection online (with the option to add additional books for $9.99/each—a fantastic deal for hardbacks), and then their pick will arrive in the mail with a bookmark and a letter describing why it’s a compelling read. There are three gift subscription options: $44.99 for three months, $79.99 for six months (this price saves you $10 through the end of 2017) or $149.99 for a full year (this price saves you $30 through the year’s end). These hand-sewn tote bags are perfect for carrying—you guessed it—books! Obvious State offers 19 different designs (like the Immanuel Kant and Wordsworth Quote options above), which are printed in Brooklyn on cotton canvas. Measuring 13 × 15 inches, these totes allow you to carry all of your favorite books in style. Started as an online photography project in 2013, Noroc’s The Atlas of Beauty highlights the authenticity and diversity of women around the globe. She’s traveled everywhere from New York City to Afghanistan’s remote Wakhan Corridor, photographing extraordinary women along the way. Now four years into the project, Noroc has collected 500 of her favorite portraits into a gorgeous book. You can check out our gallery to view some of Noroc’s captivating shots. Litographs also offers a gorgeous collection of literary tees with their new “Originals” line. Featuring art from 12 award-winning illustrators, each design reimagines a classic book. They’re available in unisex and women’s sizes, plus there’s the option to buy a matching tote bag with each one. Maybe you’ve heard it a million times, but it’s worth repeating: we’re impressed with Audible. Take the app out on long runs, road trips or work commutes, and soon you’ll have listened to some fantastic books. With one title a month, as well as other perks on additional purchases, a membership with this premium audiobook service is incredible for readers constantly on the go. The service offers three gift options: $45 for a three-month subscription, $90 for a six-month subscription and $150 for a full year. The Harry Potter fans in your life will love this gorgeous book, which collects rare and never-before-seen concept illustrations that inspired the films. It boasts over 300 pages of full-color artwork, including everything from paintings of Hogsmeade to designs for Professor Umbridge’s abominable kitten plates. You can check out this article to view some of the stunning artwork. Yes, we also included this in our Under $20 Gift Guide. But let’s be real: book lovers will always love books. So treat the bibliophile in your life to some new reads on you—and support an indie bookstore in the process. You can browse this directory to find a local store.